Oh Mariam Almaleek, we could have had something. Normally, I ignore the constant stream of spam that comes my way. But I got an email from a scammer, and I wanted to waste the scammer’s time, so I thought I would have some fun. The scammer’s emails are in indented green; my replies are in bold blue. Please permit me to introduce myself and my reason for contacting you as we have not met before. 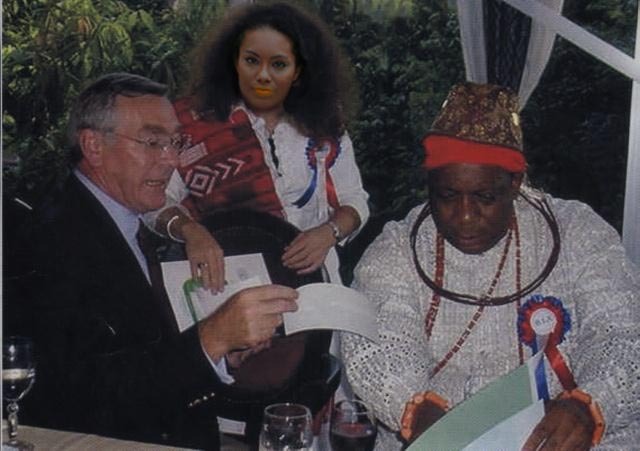 My name is Mariam Almaleek (Miss) from Ivory Coast in West African Sub-Region. I am 22years only and a second year accountancy student.I am the only daughter (child) of my late parents who died some years back (Mr .Kamal and Mrs Hanifah Almaleek). The reason I contacted you is about a business proposal you might be interestest on but before I go into details I would want to know more about you. Please respond me as quickly as possible so I can furnish you with more details. I am looking up to hearing from you ASAP. Nice to hear from you. I am a successful businessman looking for new opportunities. Let me know what you have in mind. Thanks a lot for your response to my letter. Before I go in details, I would like to re-introduce myself once again so as to allow you know more about me. My name is Mariam Almaleek, 22 years old and a second year accountancy student. I am the only surviving child of my late parents (Mr. Kamal and Mrs.Hanifah Almaleek). My mother who died when I was only 4 years was a white South African. My father married her when he based in South Africa but they later came back here in Ivory Coast in West Africa which is my father’s home country and I was born and raised up here. Before his tragic death, my father was a well known business person here who uses to export Cocoa,Rubber,Coffee and other agricultural produce from here to overseas. Sadly to say, my father was poison by his uncle because of his wealth. However, the reason I contacted you is about some money ($6.500.000) my father deposited in a bank here. My father told me by his bed side that he planned to use the money set-up a Rubber processing factory so as to enable him meet a demand of the product at that time but his uncle decided to poison him because of greed over his wealth. When his health deteriorated, he advised me to look for a reliable business person outside my country here who can assist me claim and invest the money into REAL ESTATE BUSINESS overseas. Now, I am soliciting your assistance to claim the money and to invest it into the REAL ESTATE BUSINESS as my father had instructed or any other business in your country. Please if you are interested and willing to help me, do let me know as quickly as possible so we can discuss how to proceed. I am hopefully waiting on your soonest and positive response. Thank you for the background information; I hope your father’s uncle is brought to justice over his horrible act. What a tragedy! What are the next steps for me to assist you in claiming your father’s money? Do you have any other information you can give me about his business? Thanks for your response and willingness to help me. First of all, I would like to assure you that my late father was a well respected person during his time and he earned the money by honest means. The reason I contacted you for help is because of my father’s advice to me to look for someone outside here to help me invest the money overseas so I can stay away from his siblings. Now, I would want you to tell me more about your self and your government’s condition concerning foreigners coming to invest there. Also, I want you to send me your personal information’s such as ( your Identity Card, your address, telephone and fax number) so I can submit it to the bank here. I will send you the deposit slip of the money and other details as soon as I submit your personal information’s to the bank and you will contact the bank to know how the transfer can be carry out to your account. While the transfer will be going on, you will send me a letter of invitation so as to allow me get your country’s visa here because I would want to join you there immediately after the transfer is done. I am hopefully awaiting your soonest response so I can proceed. I have been working in the software business for about 20 years now and I’ve had several successful investment engagements with foreigners already. In fact, I find this type of work to be very rewarding. I once partnered with a languishing software reseller that was struggling until we found some investors from overseas. Now the company is pulling in $20 million annually. Our government seldom has problems with overseas money, as long as the investments are not made with illegal means. To this end, I will be willing to provide my personal information if I can receive a token of good faith, such as a picture showing the letterhead of stationary used by your father’s business, or a picture showing yourself and your father together. I look forward to doing business. Thanks for telling me about you. See in the attachment a picture I took with my late father and his French business partner when they inaugurated a joint Rubber processing company here few months before my father’s death but its regrettable the way my father’s share in the company and other assets was sold off by his uncle after my father’s death. 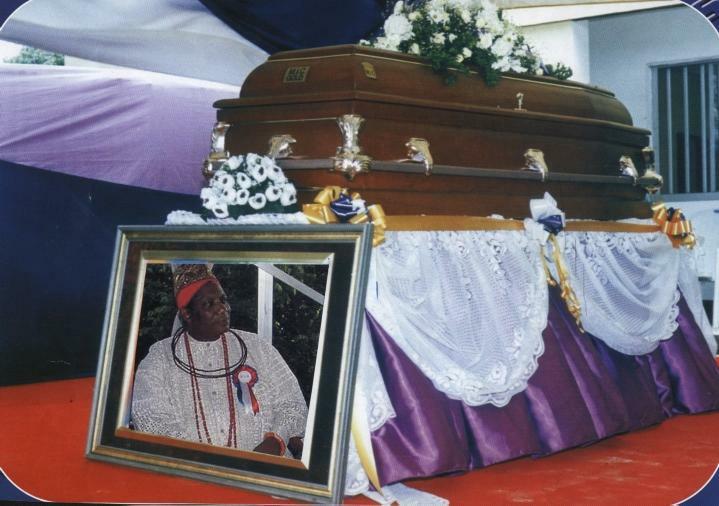 Also you will see in the attachment a picture of my father’s coffin during his burial ceremony. As I said before, I will send you the contact of the bank and other details concerning the fund as soon as I received your information’s and submits it to the bank. Then you will negotiate with the bank on how to get the fund transfer to your account. Uh huh. Yeah. Look at her head in that second picture. Click to see the bigger version, and look at how her head stands out from the rest of the picture. See in the attachment three more of my pics. Uh huh. What I want to know is what the poor woman who posed for these photos thinks of being used in an international scam like this. Thank for the information and photos. As I prepare my personal information, I would like to get some more information about the Rubber processing company so I have all my records straight before we conduct our transaction. Can you tell me the name of the company, as well as the full names of your father and uncle? I have given you the necessary information’s about me as well as my late father’s picture as you requested but I am wondering now if you really want to help me?. Please, this is a transaction that involves large sum of money my late father toiled in years to earned here, therefore I need to know more about you so as to reassure my trust in you. I will send you further information’s as requested but let me get your details and conclude discussion with the bank here. Mariam, thank for this opportunity. I understand your concern. But from time to time I receive information about people that are not honest about their business transactions online. I really do want to help you. But I need some more evidence that you are truly who you say you are and that your father did indeed leave you the money. All I need is some more information about the names of your father and uncle, and the name of the Rubber plant. Also, tell me which details you need from me to initiate this transaction. What kind of bank account will work best for you? Thank you for your response, but I would say that your interest to assist me was rather unspecific following the sentences contained in your reply. You seem to doubt the authenticity of my proposal which I dont find strange because of the means by which I have contacted you, Please accept my apologies for this, it was due to prompt accessment of your recent email. I am quite skeptical in believing that you really want to help me,if not, why were you reluctant in sending me your personal data so as to allow me know whom I am dealing with. Considering the money involved, it is rather uncompromised for me to release more information about my family unless i see your reliable information and be sure of the person I am entrusting my father’s hard earned money to his hand, my trust is not given out lightly on this. I need to be convinced that you are a honest person with some integrity. You should also have trust in me as I will have in you otherwise what will be the point going further if we cannot establish some trust for each other. It is true that I contacted you for assistance due to my present situation as orphan but your decision to help me will only be at your free will as I cannot impose it on you, it is your choice to disagree or accept with the principles as a whole. I would indeed be overwhelmed seen you in person here if that is possible, perhaps I would lead you to the bank so you will stand as my guidian to do a face to face negotiation with them concerning this transaction. Well if I may remind you again, you are required to send a copy of your Driver’s Licence or your International Passport, your address and phone numbers. My curiousity can be justified considering the money in question, besides, it is this copy of your Driver’s Licence or International Passport that will be be used by the bank to have all the necesary documentations perfected. If you really intend to help me it would be necessary to have these scanned and sent to me immediately via email attachment. Sorry for the long delay in replying – I was away on travel for business. It has been a very stressful time for me and unfortunately my emails have piled up; it’s been hard to keep up with everything. I’m sure you can relate to this. Do you have days like this when you think you simply cannot keep up with everything that’s happening? Sometimes I wonder if I am in the right profession. Have you ever thought this? What would your dream job be? I am very curious, since you are from another country; I believe our American work culture is very different from other countries. I’d be very interested to know what it’s like to work in your country. Anyway, I had some problems with my old scanner. I went out and bought a new one, but the Windows drivers were flaky – the scanning program crashed a few times. 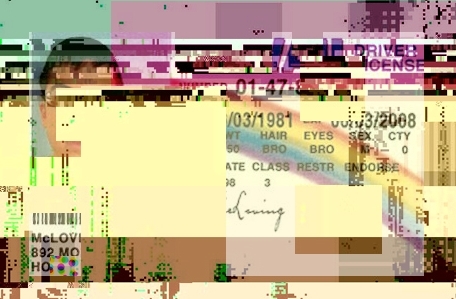 But I did manage to get a good scan of my license in between crashes. It is attached. I look forward to speaking with you about the next steps. I hope I can be of assistance in your time of need! Thanks for your email I had received. Anyway, I will be waiting till you put your scanner in order, then you can send me a clear picture of your identity card with your separate picture to my curiosity. Also you will send me your address, and phone numbers. I will tell you when I get your clear scanned identity card and other information’s. What you sent can not be considered identity card as no immage appeares in it. I think I have resolved the problem with my scanner. Probably something to do with gamma rays and sunspots. Anyway, my license is attached. I look forward to the next steps of our business arrangement! Yes. That’s right. 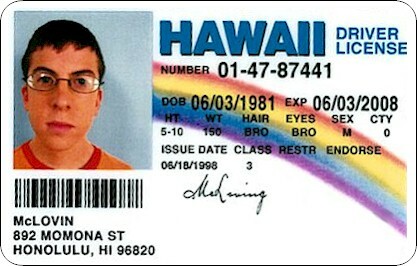 I *am* McLovin’. I didn’t hear from her again. Well, duh. This entry was posted in crackbaby, funny, meaningless, pain, scams. Bookmark the permalink. Totally $%#&ing awesome!!! One of my coworkers played a similar game with one of these scams, but this is the absolute best!!! Well, was great that you spent time responding to a nigerian scam letter for a laugh, I “seriously” cracked up when I read “I need to be convinced that you are a honest person with some integrity.” Amazing. Yes, nicely played, Dave! I had short correspondence with one of these people from one of my spam email accounts many years ago, but it never got to the point of photographs. I like how you played the role of a businessman, interested in investment opportunities. I played the role of a naive, compassionate person who wanted to do everything I could to help the poor scammer with their money-transferring dilemma. I don’t quite remember how things played out, but I know they stopped replying at some point. I think I sent them some fake contact info and might have gone as far as providing a “test” credit card number (one that passes some sort of validation techniques but doesn’t allow actual charging). This video made me think of your post today. Dear “Mr David” I have one word for you EXCELLENT. I was rolling about with total laughter, as each step went on I could sense “Mariam” thinking just a little bit longer. Maybe IT will be the next E-Mail. THEN THE MONEY AND ID THEFT WILL START COMING TO PLAN……………………! On a personal note I wanted to see the phrase ONE MILLION involved. But by that I mean I wish this thread had a “million clicks” lol…. Well done congrats. and thanks for the entertainment……………! I came across this site from a Yahoo article on cipher codes. This was fantastic!! Well played, Sir! !